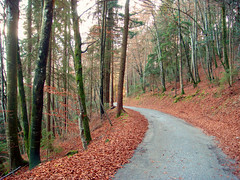 This is another beautiful deserted road built it seems just for cyclists. It's extremely steep with a 5 km stretch averaging 10.5% and one full kilometre averaging 12%. But it's a pleasure winding up through the quiet woods with periodic views of the Alps in the distance. Another beautiful clear sunny day. 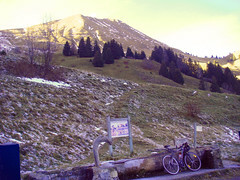 Today I cycled Le Mole, the distinctive triangle shaped mountain about 20 kms south of Geneva near Cluses. This is another perfect deserted road built it seems just for cyclists. It’s extremely steep with a 5 km stretch averaging 10.5% and one full kilometre averaging 12%. But it’s a pleasure winding up through the quiet woods with periodic views of the Alps in the distance. It goes to about 1,330 metres. the paved road stops here, although there are trails to go a bit farther – or hike up towards the peak at over 1,800 metres. But it was a cold and a bit icy – so I stopped here. Previous ArticleA Monster of a Climb? Did this today on my training road bike with 34×25 my lowest gear. My Garmin put some of the stretches at 20% so beware! The last 3.5km has been resurfaced and is in great shape, the 3.5km before that however is still pretty rough, the first couple of km are normal roads. Hopefully they’ll resurface that middle part.